I have not been posting since the 2nd October. Not that I have not eaten but I have not been cooking and I have not eaten anything which I deem interesting enough to share it here. 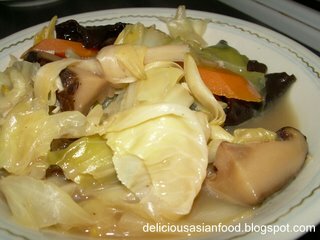 Recently though, my mum cooked Mixed Vegetables consisting of cabbage, carrots, wood-ear fungus, mushrooms and dried lily buds (kim cham). Dried lily buds are unopened flower buds of lilies and also known as “golden needles”. The buds need to be soaked in water for at least 30 minutes followed by tying itself in a knot at the middle. The wood-ear fungus also need to be soaked in water till soft prior to cooking as they come in dried form. This is the recipe for Mixed Vegetables using Cabbage, Carrots, Wood-Ear Fungus, Chinese Mushrooms and Dried Lily Buds. Heat oil in wok at high heat. Add garlic, chinese mushrooms and wood-ear fungus. Stir fry for 1 minute ensuring the garlic does not burn. Add carrots, dried lily buds and cabbage and continue stir frying for another 2 minutes. Add a little water (from the water used to soak mushrooms) at a time to ensure that the vegetables do not dry out. Add light soya sauce, oyster sauce, salt and white pepper followed by 1 cup of water and let it boil with lid closed. Cook for about 3 minutes or until cabbage is slightly limp. Finally, add chinese cooking wine and adjust seasoning to taste. This is followed by the corn starch to thicken sauce to your desired thickness.